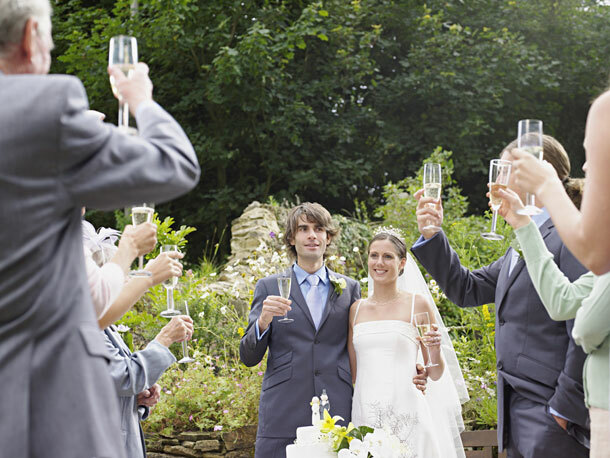 Just what is the difference between the speech and the wedding toast? And who gives them? How many toasts should there be at a wedding? I’ve got to be honest and say that I left all of the ‘pomp and ceremony’ up to my partner. We didn’t have best men or bridesmaids, which meant fewer speeches and fewer toasts – something of a relief all round. A toast, according to wiki, is ‘a ritual in which a drink is taken as an expression of honour or goodwill.’ Simply raising your glass towards someone and then drinking serves as a toast too. It’s a message of goodwill towards the person. A toast is a snap. It’s short and sweet and about future happiness. A speech is longer – round two to four minutes – and the toast is usually its conclusion. Putting down one’s glass before the toast is finished, or not drinking but simply holding the glass, is seen as ‘impolite’ or that one doesn’t share the sentiments of the toast. Toasting at weddings can be rather elaborate and follows a set formula. But it’s up to you how much of the tradition you follow. The father of the bride usually offers the first toast whilst thanking the guests for being there and usually mentioning a titbit of the bride’s childhood, whilst wishing the newlyweds a happy life together. The best man toasts the newlyweds, usually at the end of a speech. This can be followed by the bridesmaid or maid of honour who does similar. Finally the groom offers a toast to the bride’s parents, the wedding party and dedicates the toast to the bridesmaids. Which we shall plant tomorrow. May the best of your yesterdays be the worst of your tomorrows.